No gear position switch voltage Gp switch voltage is not within the following range. 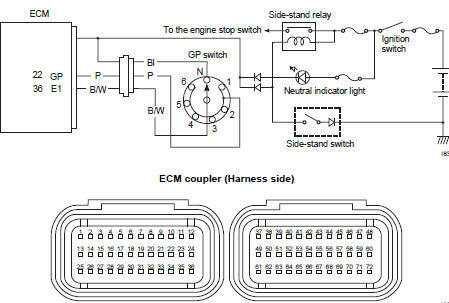 Gp switch circuit open or short. Check the gp switch coupler (1) for loose or poor contacts. If ok, then measure the gp switch voltage. Fold the side-stand to up position. 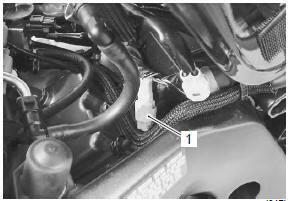 Make sure the engine stop switch is in the “run” position. Measure the voltage between the p and b/w wire, when shifting the gearshift lever from 1st to top. P or b/w wire open, or p wire shorted to ground. If wire and connection are ok, replace the gp switch with a new one. 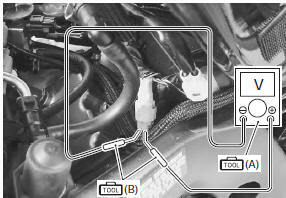 Refer to “gear position (gp) switch removal and installation” in section 5b (page 5b- 14).